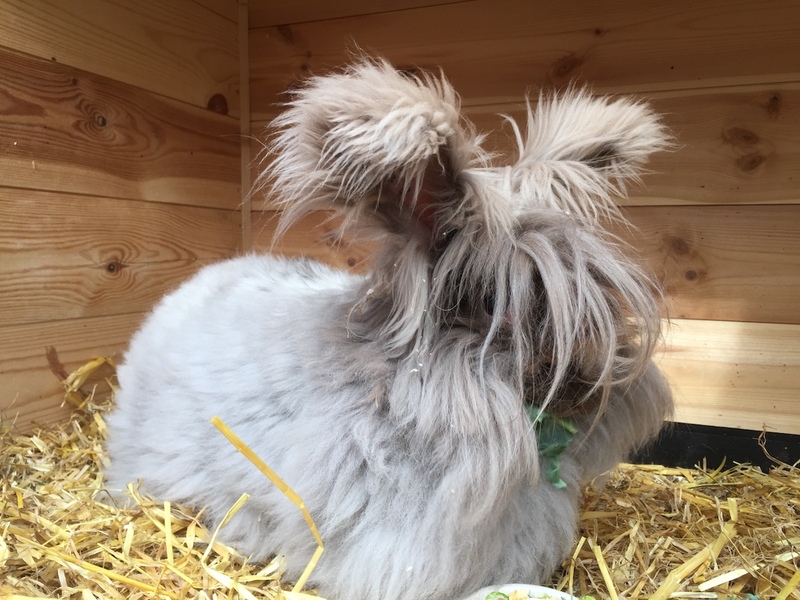 The appeal of the coloured Angora does not rest with the beauty of its appearance, but holds still more fascination for those who make use of its wool. 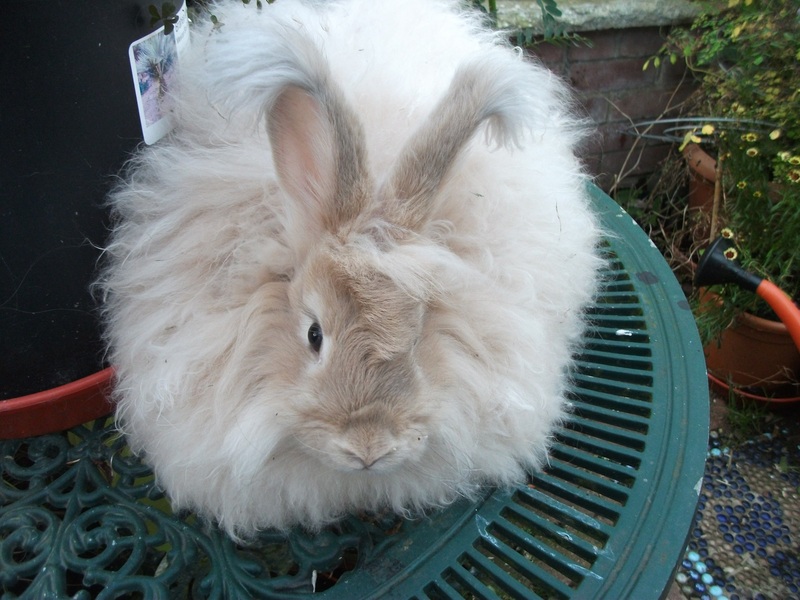 It is often said that only a handspinner can really appreciate coloureds to the full and only when one handles the wool do the material qualities of the rabbit become apparent. A well-made garment in perfectly matched natural coloured Angora stands way and above any dyed counterpart, and assumes that “exclusive” appearance so sought after in fashion circles. 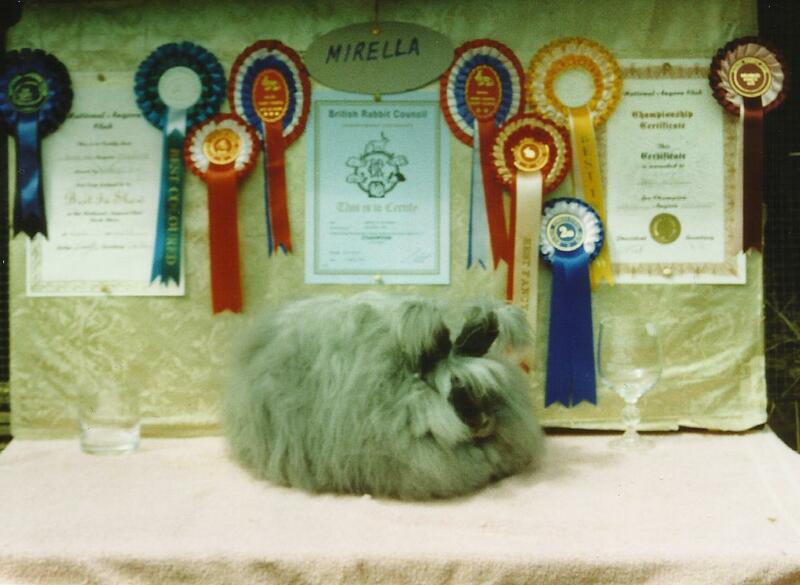 Twelve natural colours are recognised by the Angora Clubs. 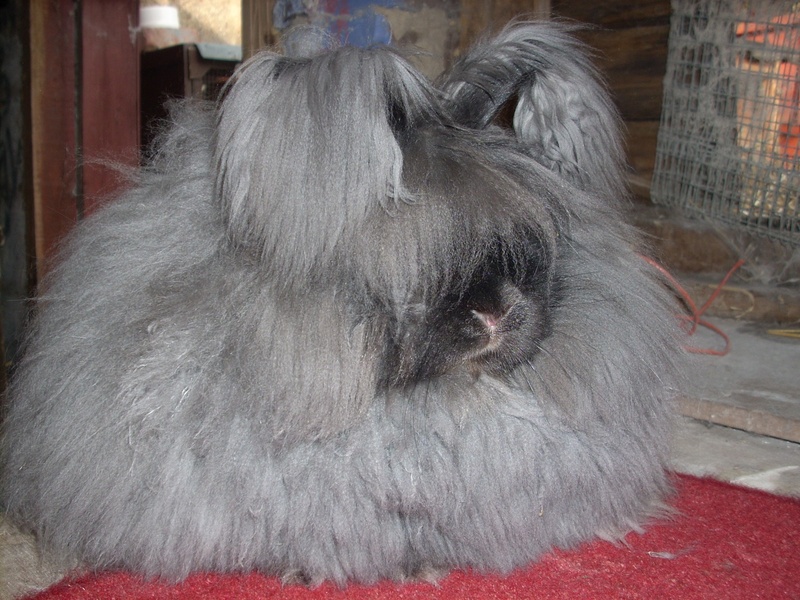 All, originally, were evolved from the normal fur breeds, some colours indeed are still reluctant to relinquish such ancestry, and retain certain features that are considered undesirable in a first-class Angora – the Golden, for instance, often develops a coarse textured coat after a year or two, due to its origin in the harsh-coated New Zealand Red and whose type does tend to dominate the more preferable compact roundness of the true Angora. In general quality, pride of place is held by Smokes and Blues, furnishings, coats, and general points being little short of those possessed by a really good White, in fact, outstanding specimens in these colours have been known to take premier honours over all breeds at shows in recent years on more than one occasion. Smokes and Blues are often inter-bred to the advantage of both colours. 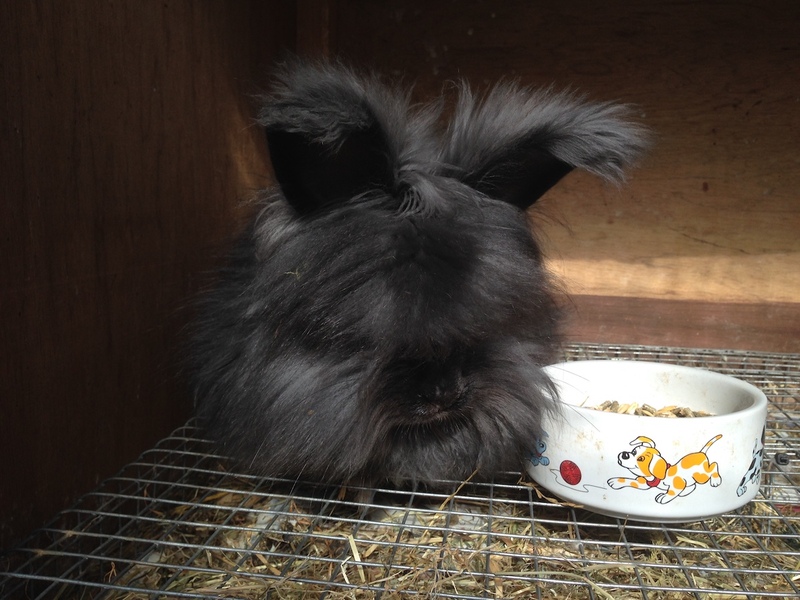 The Smoke, our nearest approach to the black Angora, is born jet black and remains so until about nine or ten weeks old when, as the coat lengthens, it begins to lighten in colour, until at about five months, the rabbit has a dark grey body coat and furnishings, but retains its black feet, head, and ears. No particular shade is specified for the Blue so long as it is a clear shade with no sign of rust. Handspinners prefer a light shade, but many exhibitors favour a darker blue that does not appear so light when in full show coat. 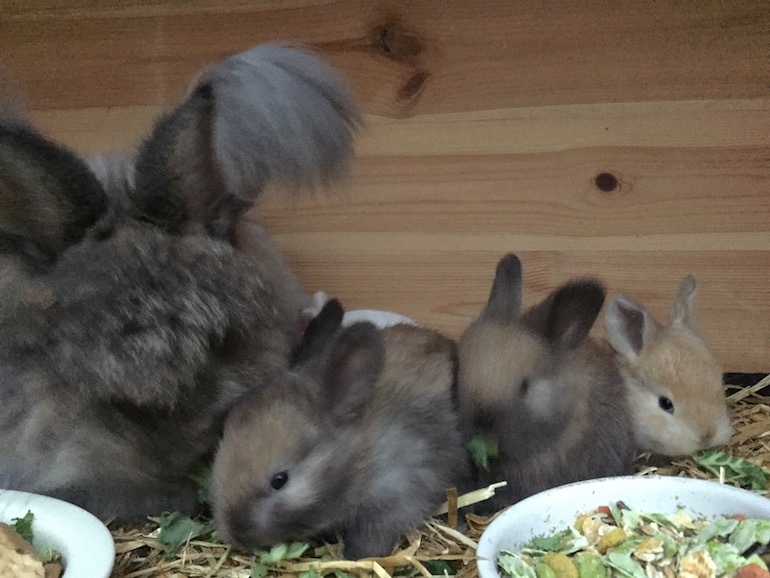 Next in order of general quality come the Sables, Chinchillas (each similar in colouring to the fur breed), and the Brown-Grey which has the colouring of the wild rabbit, a colour whose beauty is not obvious to many a casual observer, and one which has to be kept to appreciate the subtle colourings hidden in its coat. There is also the Blue-Grey, wherein the black hairs of the Brown-Grey are replaced by blue, giving a very attractive appearance. All colours mentioned so far can be expected to have really good furnishings on head, feet and ears as in the White. 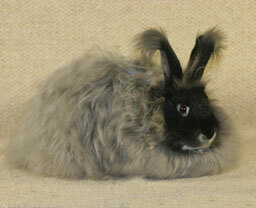 The rest of the colours are seldom seen with furnishings and therefore are rather handicapped in the show pen. These include the attractive Golden, in a rich bright colour similar to a ginger cat, the wool shading to a creamy base; there is the Chocolate of Havana shade, the Sooty-Fawn, and the Blue-Fawn, the latter two often making their appearance to Golden litters, which they closely resemble, the wool being golden with chocolate or dark blue shading respectively on the face, ears, feet and lower flanks. The cream though recognised, appears to have been extinct for many years, but was, I understand, a pale version of the Golden, but with blue eyes instead of the Golden’s brown. Cinnamons, too, are practically extinct. These are similar to the Brown-Grey, but with chocolate replacing the black. Broken-coloured Angoras are not recognised at all. In fact the smallest blemish in the form of a white spot is regarded as a serious fault and usually results in total disqualification on the show bench. To keep colours rich and clear, certain unwritten laws have to be observed before interbreeding them with the object of improving a particular shade. As previously mentioned, Smokes and Blues can be interbred; mixed litters resulting. 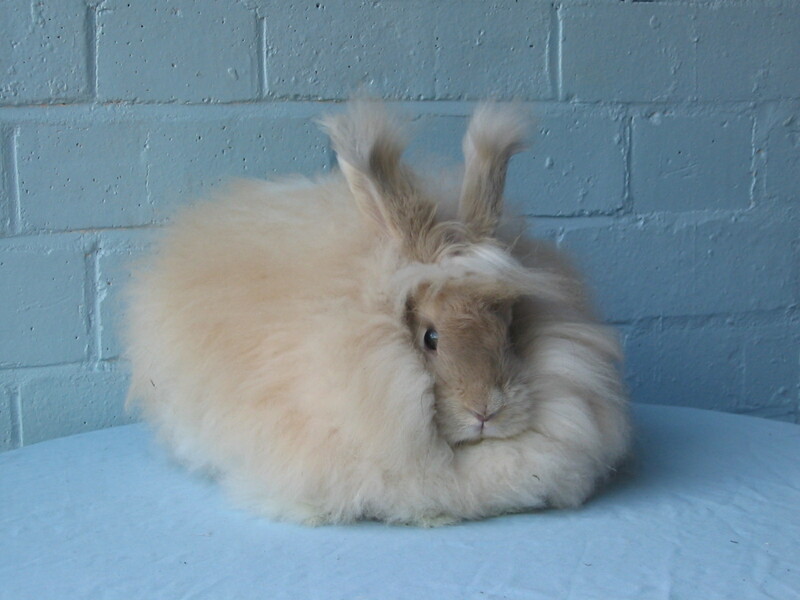 I do, however, strongly deprecate the introduction of White breeding into either of these colours as, though the results from the first generations may be very pleasing, subsequent generations are liable to bring forth a legacy of white toes and nose spots, wool with the undesirable pure white base, and ears and faces peppered with white hairs, all weighing heavily against the rabbit on the show bench, however, it may excel in other points. Selective breeding between Smokes and Blues is sufficient to maintain top quality, making the introduction of White breeding and its attendant risks unnecessary. 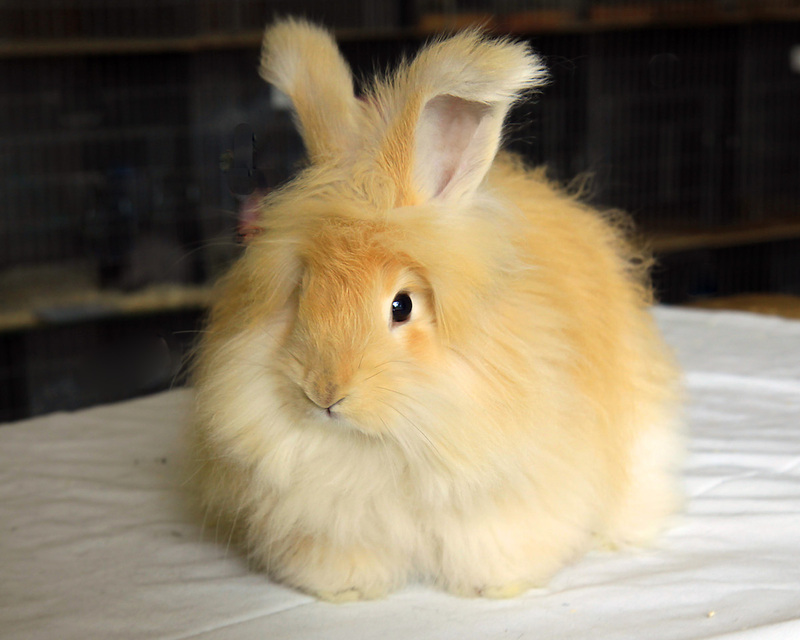 On the other hand, there is no objection to interbreeding Whites with any of the colours whose coats are grouped in the Agouti or Shaded sections; the Chinchilla, Brown-Grey, Sable, Blue-Grey, and Cinnamon. These react quite favourably to such mating, producing mixed litters which are easily distinguished at birth. One has to be careful not to overdo the White breeding or colour will suffer, and the proportion of coloured babies in the litters will dwindle to perhaps one only. 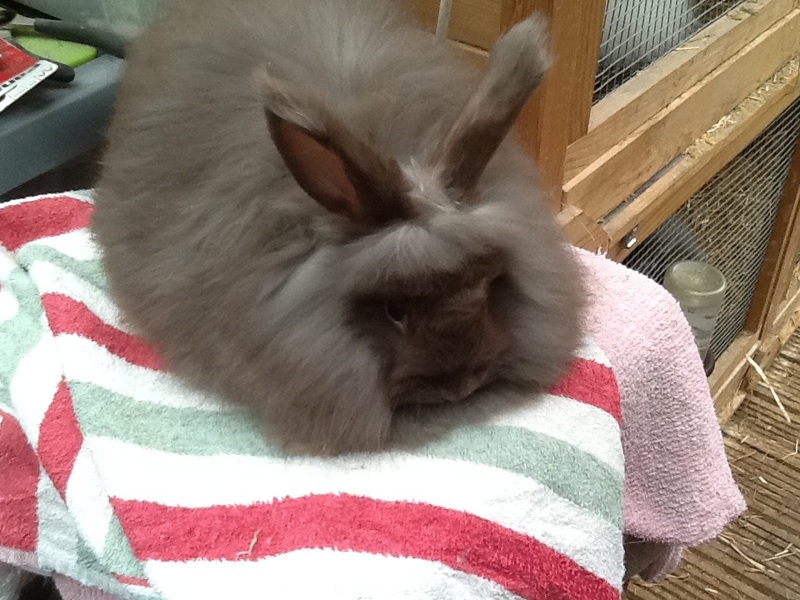 Apart from White, Chinchillas and Sables should not be mixed with any other colour. 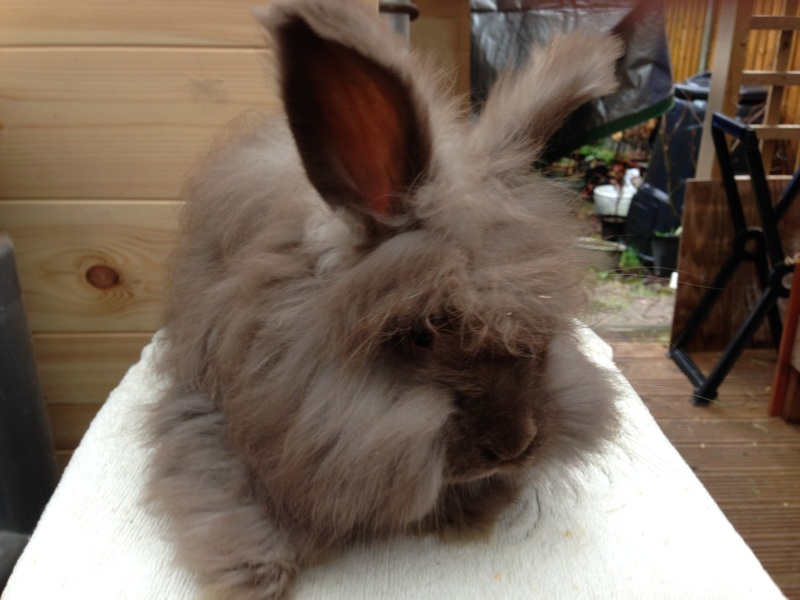 Brown-Greys and Blue-Greys may be mated to Smokes or Blues, though any Smokes or Blues appearing in the resulting litters are rather prone to be rusty in colour, their Brown-Grey or Blue-Grey nest-mates most likely to prove better rabbits. In the last group come the colours which have to be kept strictly to themselves, the Golden, Sooty-Fawn, Blue-Fawn and Chocolate. No matter what other colour is mated with the first three mentioned the result is a litter of Brown-Greys. Even if one mates back these Brown-Greys to Goldens for generations, and Goldens do eventually appear, their colouring will be very pale and drab, and it would take many generations to restore their lost brilliance. Chocolates react in the same way, producing poor quality Smokes with a bronze sheen when mated to any other colour. This explains why these colours are so behind the others in general quality, in wool yield, furnishings, and finer points such as width of skull. However, their attractive colour fully redeems them. Golden and Chocolate wool is in premier demand over all other colours among handspinners and, consequently, fetches a higher price. Oddly enough, the colours that produce the most wool and are better in quality from the exhibition point of view, produce the shades of wool that are least in demand. Blue enjoys fair popularity, as do Chinchilla and Sable, but Smoke and Brown-Grey hardly any. 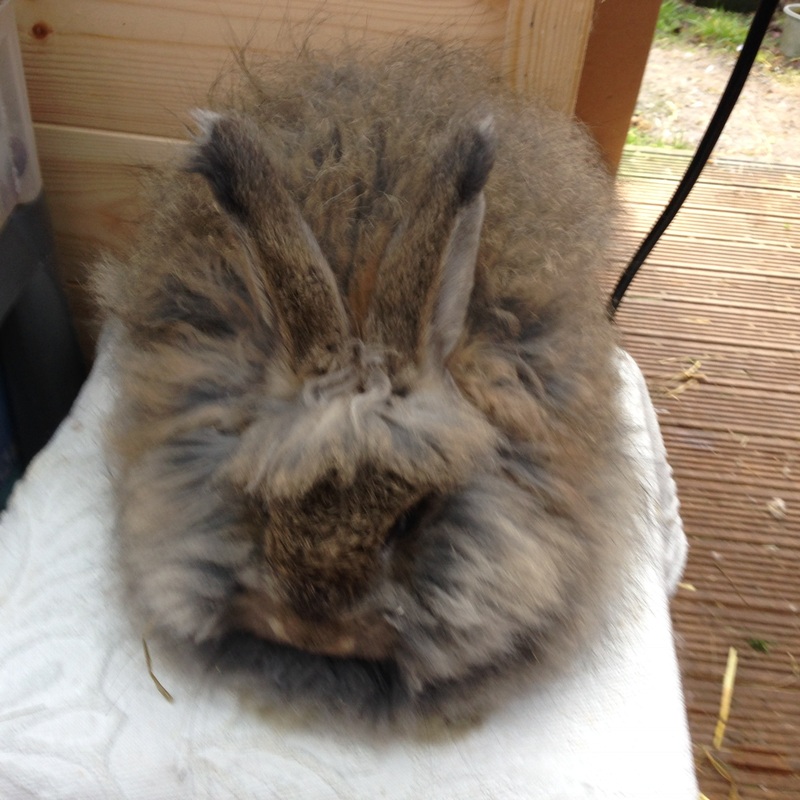 Coloured wool is best harvested by plucking, a little inconvenient perhaps, as we have to wait for moult to loosen the coat before it can be taken, and only then over a period of two or three weeks. The advantage is that the following crop of wool comes through in full colour, not pale and washy as it would do after clipping. Also, the handspinners insist on plucked wool, as it is far easier to make into first-class yarn. Some spinners prefer to have the strong guard hairs plucked out before the wool is harvested, others, who specialise in fluffy garments, prefer them left in, so it is advisable to make sure of that point before harvesting. When harvesting, keep each rabbit’s coat separate, so making it far easier for the spinner to match the wool in shade, length and texture before spinning, the essential groundwork towards the making of a perfectly even-coloured garment. The breeding of coloured Angoras has a thrill from the most experienced breeder to the veriest novice. In most colours it is possible to distinguish the colouring of the babies on the day of birth, but Sables are born a bluish shade. Goldens, Sooty and Blue-Fawns require about three days to show full colour. 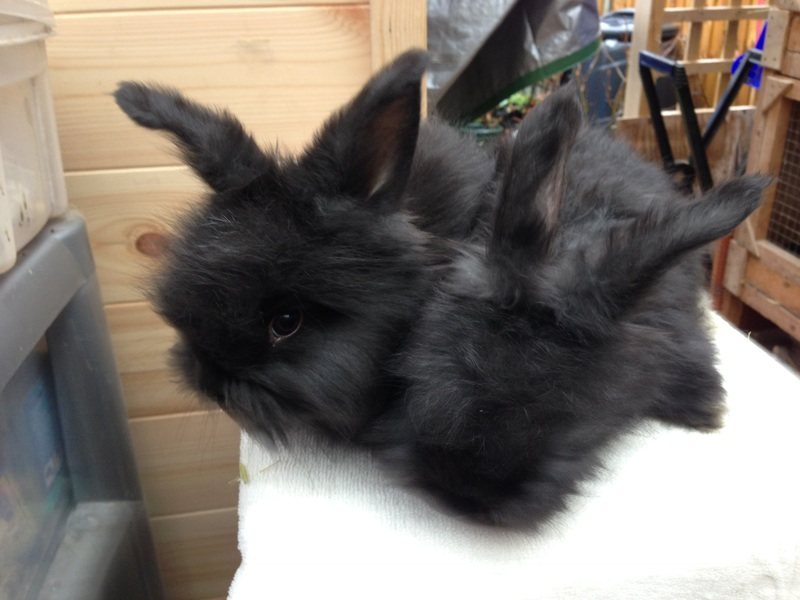 It may be difficult for the novice to separate the Brown-Greys from the Blue-Greys, the latter appear as blue rabbits with pink under the chin, round the nostrils and underneath. In Brown-Greys, the blue is replaced by black. At this stage, one must make the decision on the future of the litter. If it is intended for exhibition, then reduce it to two, or, at the very outside, three babies. For wool production four may be kept. 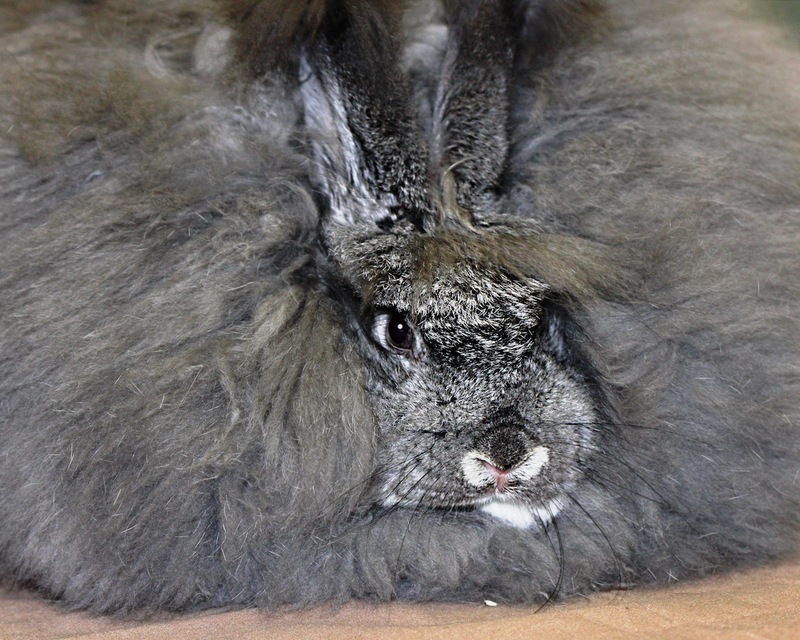 As it is the custom in this country to regard the first coat of an Angora as the show coat, the rabbit must be well developed, and to do this must reap the benefit of a full share of its mother’s milk, something for which the most luxurious feeding cannot compensate, hence the wisdom of allowing the doe to rear a small litter. Exhibiting the Coloured has a fascination of its own There are none of the worries of the exhibitor of the Whites over soiled coats or the effects of foggy weather, but to pen a first class Coloured fit to compete with the best, careful grooming is essential. In a Coloured the slightest break in coat or the breaking off of the treasured coat tips on which so much colour depends, is far more obvious than on a White. Brushing will quickly spoil these delicate tips, so it is advisable to do all grooming with bellows and fingertips. There is one definite advantage that the Coloured has over the White in the exhibition world. With careful handling a Coloured can be exhibited season after season, whereas a White is regarded as at the end of its show career at 7-8 months. In my opinion the coat that is grown after one year old is far superior to the baby coat, which, by the time it is 7 months old is completely dead. And, like human hair, loses its colour. Those later coats have a far greater depth of colour. Probably the plucking of the wool instead of clipping assists the Coloureds to grow a more shapely coat in subsequent years, and certainly plucked coats are far less prone to matting. There is much to favour the exhibiting of over-year Coloureds. 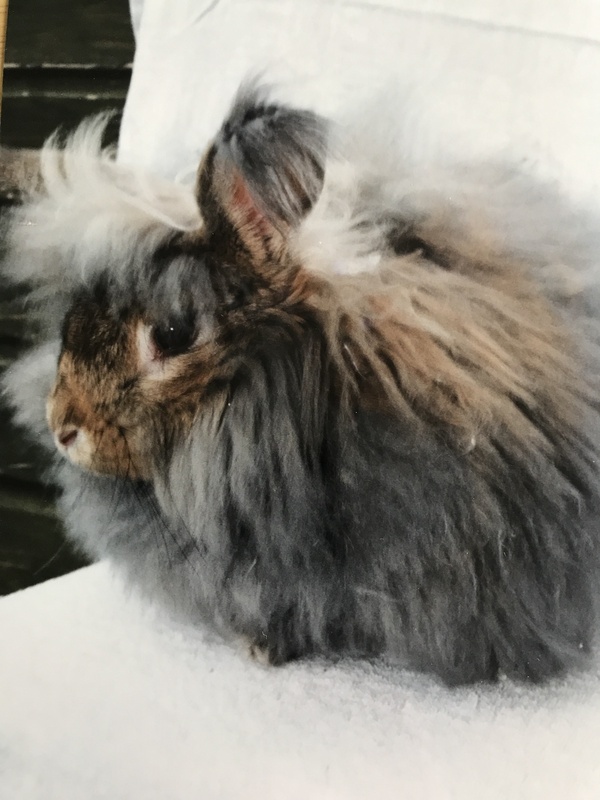 A wide field of opportunity is open to all who take up the Coloured Angora, whether established breeder or novice, and most particularly to those of sufficient pioneer spirit to devote their attention to improvement of one of the lesser advanced colours. 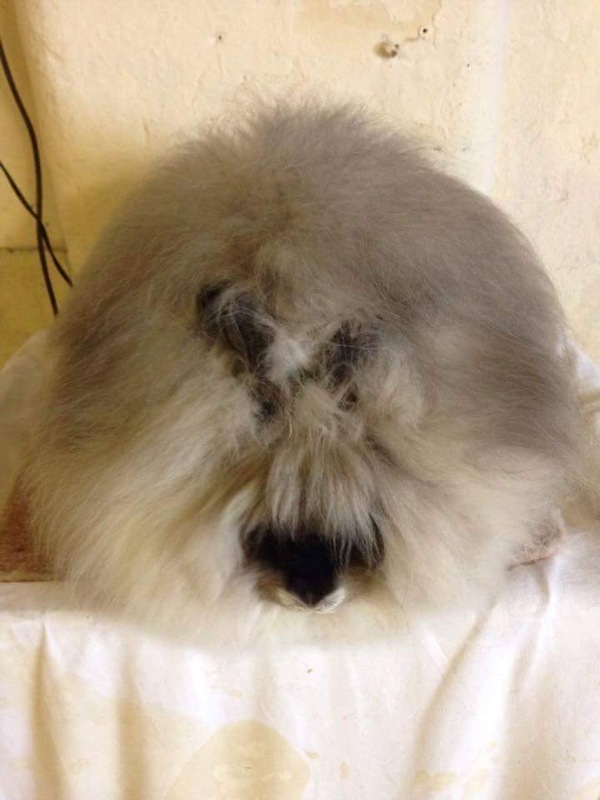 Not only is there the joy of breeding good stock for exhibition or wool production, but the possibility of establishing a small industry of home-produced garments kitted or woven in natural Angora. 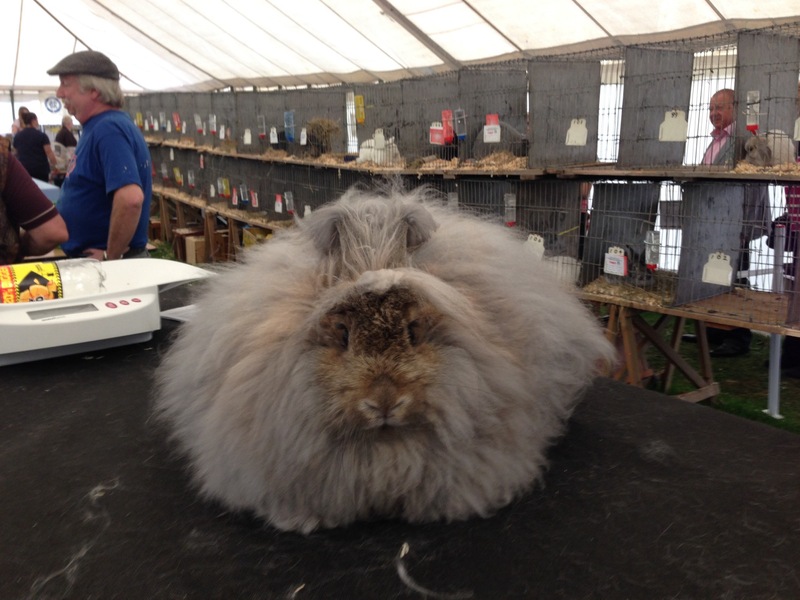 When Angora wool is sold at craft fairs such as Woolfest in the present day, Smoke, Golden and Chocolate appear to be the favourite colours, although all colours sell well compared to White. 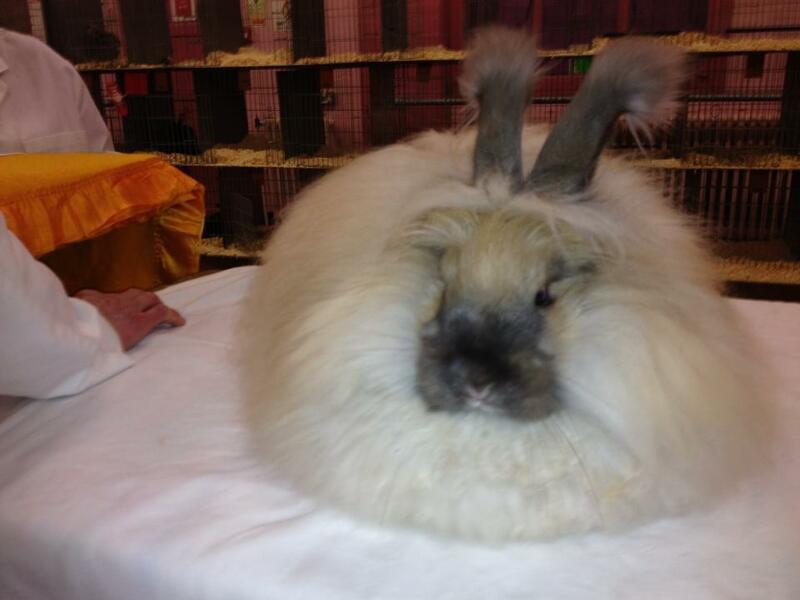 There is no commercial market for English Angora wool at present, due to competition from the Chinese Angora Industry. Posted 25/02/2018 by SM & filed under Breed Standard, General interest.